General Admission $69, reserved $139. Service fees not included. 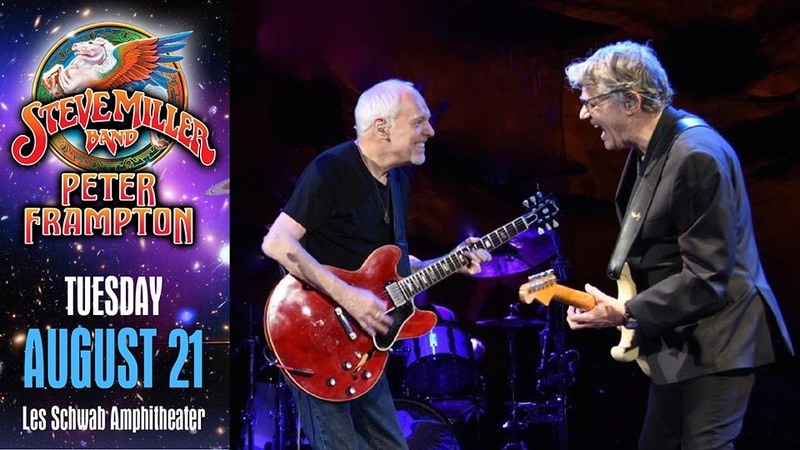 The Steve Miller Band and Peter Frampton, two musical legends, are teaming up again this year for an epic summer of classic rock. A mainstay of the San Francisco music scene that upended American culture in the late 1960s, Miller perfected the psychedelic blues sound that came to define a generation on albums like Children of the Future, Sailor and Brave New World. Similar to Miller, Frampton has been a major musical creative force since the 1960s. At age 16, he was lead singer and guitarist for British band The Herd. At 18, he co-founded one of the first supergroups, seminal rock act Humble Pie. His session work includes collaborations with such legendary artists as George Harrison, David Bowie, Jerry Lee Lewis and, among many others. Frampton also served as technical advisor on Cameron Crowe’s film “Almost Famous,” as well as appearing in it and writing songs for the soundtrack. He recently celebrated the 40th anniversary of his fifth solo album, Frampton Comes Alive!, which remains one of the top-selling live records of all time.